Lifetime Compost Tumbler Review: Is It A Reliable Composter? 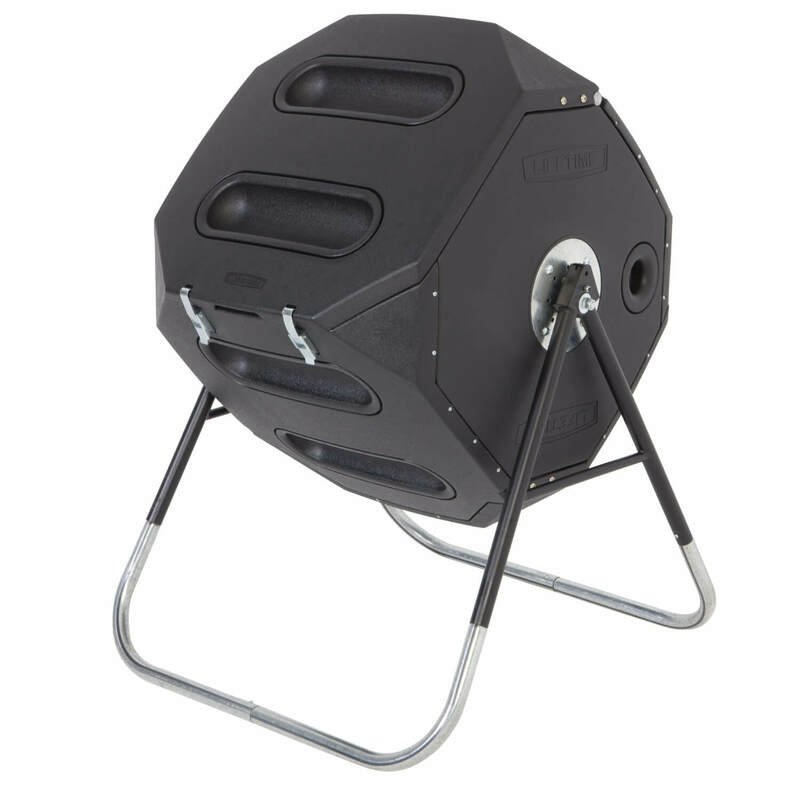 The Lifetime offers a large capacity of 65 gallons or 8.69 cubic feet. The tumbler has a creative design which allows it to turn on its axis in perfect equilibrium. The product features an internal aeration bar that mixes the compost and promotes air flow while its double-walled panels draw in and hold heat. For extra convenience, it has an extra-large lid, making it a great addition to any garden. ​This tumbler has a height of 44 inches which is convenient for loading food or garden scraps. With this height, you can easily access the tumbler and load it with any organic scraps. There is no need to slouch down and hurt your back while loading the Lifetime because you can load it while standing up. As compared to the Redmon Green Culture, the Lifetime has a better design. The tumbler can also be spun easily while the Redmon compost bin is stationary. Also, the Lifetime is superior in terms of capacity and height convenience but it falls short in terms of price. It also has a more difficult assembly process than the Redmon tumbler. The Lifetime is a better choice than the Envirocycle Composteamaker because it has a larger capacity, spinning is more convenient, and the tumbler is the perfect height. Unlike the Envirocycle which requires you to either sit or lean over to turn the barrel, the Lifetime tumbler can be turned on its axis while you are standing. However, it needs to be assembled, unlike the Envirocycle which comes preassembled. Although both barrels spin, making the composting process easier, the Lifetime tumbling composter is less expensive than the other brand, but it lacks the compost tea capability that the Envirocycle model offers. To rotate, you simply add waste to this composting equipment and turn it by hand. Then, when you add new waste, it is brought directly into contact with the compost that is already forming. When you turn your compost bin, it also provides it with oxygen, and this ensures the microbes responsible for decomposition receive the vital oxygen. Large Capacity - A holding capacity of 65 gallons of garden waste and kitchen scraps makes it useful for large amounts of composting. You can generate as much compost as you desire. The Lifetime is an effective tool in the garden, especially if your aim is to fertilize a large area. Easy To Use, Well Balanced - The operation of this composter is easy because it rotates on its axis which saves you the time and work involved with manually mixing a compost pile. The garden wastes and food scraps can be easily loaded in the tumbler. With the large lid opening, loading is quick and simple. Mixes Well & Composts Fast - Compost can be generated as little as 14 to 21 days under ideal circumstances. With the internal bar feature, mixing the compost pile is more effective and airflow is enhanced, assuring you will harvest nutrient-rich compost faster. The double-walled panels also contribute to a faster composting process as the heat is trapped inside the tumbler even during the winter. Requires Assembly - There were a few customers who have complained that they couldn’t manage to assemble the product on their own. They needed another person or more tools to accomplish the assembly task which includes drilling holes to install the plastic bolts. Rotating At Full Capacity - Some customers have had issues with the turning feature of the tumbler when it reached its maximum capacity. The product tends to be too heavy to rotate. To prevent this from happening, you can add more dry leaves when the tumbler reaches half capacity, so as to balance the weight of the large volume of scraps and compost. This is a simple way to balance the tumbler. Parts Eventually Rust - Quite a few customers have complained that after some time, the metal parts rusted. Those tumblers may have been exposed to too much moisture or rain. If you want to keep the metal parts from rusting, it is advised that you oil them regularly. Another option is to choose a composter that promises to be rust-free, like the Redmon Green Culture 65-Gallon which is made entirely of plastic. Latches - Some customers have had problems with latches that have failed after some use. This poses a big problem when you spin it. This can be avoided by handling the latches carefully. Never pull or exert too much pressure on the latches when opening or closing as that can cause damage to the latches. Is The Lifetime Composter Right For Me? People who need a composter with a large capacity and is simple to operate. Not for people who are want something preassembled or have trouble putting things together. If you are looking for a preassembled compost bin, you should consider other brands like the Envirocycle﻿. Then the Lifetime 60028 is highly recommended, especially for those who want to do a large amount of composting. Despite its large size, the tumbler is priced considerably less than other models with similar features. However, it is important to note that turning it may be difficult due to its large capacity, but overall, it is an ideal composter for those who have a large amount of food and garden waste or want to produce a large amount of compost.